Minimum age 13 years old as at 01Jan17. This is a British Fencing ranking event. The day is in two halves with the juniors in the morning and the seniors open in the afternoon. Ideally suited for fencers new to fencing competitions as well as the regular competition goer. 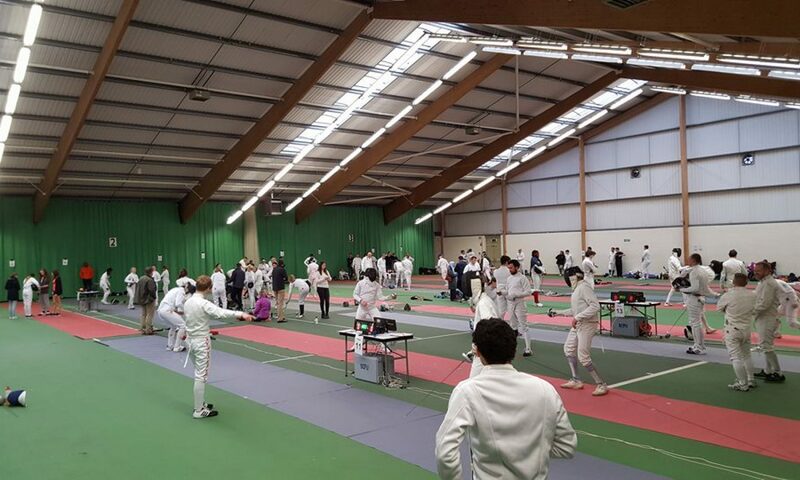 Fencers aged over 13 years old (as at 01.01.2017) have the choice of doing either the juniors, seniors or both. 18 Carpet pistes. Men’s event capped at 90 fencers. Competition format: One round of poules, everyone promoted to Direct Elimination (U9, U11, U13 to 10 hits, everyone else 15 hits in the DE’s). DE Timings: 10 hits 2-1-2-1-2; 15 hits 3-1-3-1-3. Requirements: BFA membership will be required. This will be checked on-line prior to the competition so any late entrants will be required to provide paper evidence of membership. It is recommended that fencers join the BFA online. All fencing clothing and equipment must comply with BFA regulations. Winners medals kindly provided by Leon Paul.